Recipe by Massimo Pace, Junior category for Lamb Brand Kids Competition during Kwalita Malta 2016. 2. Lightly grease a large rectangular baking dish and line with a piece of parchment paper so the bars are easier to lift out. 3. In a large bowl, mash the banana until smooth. Place the rolled oats into a food processor (or blender on the lowest speed) and pulse until the oats are coarsely chopped (but still with lots of texture). Stir oats into the banana mixture. 4. Stir the rest of the ingredients into the banana-oat mixture until thoroughly combined. Spoon mixture into prepared dish. Press down until compacted and smooth out with hands until even. 5. Bake for 23-27 minutes until firm and lightly golden along the edge. Place dish on a cooling rack for 10 minutes then carefully slide a knife to loosen the ends and lift out. 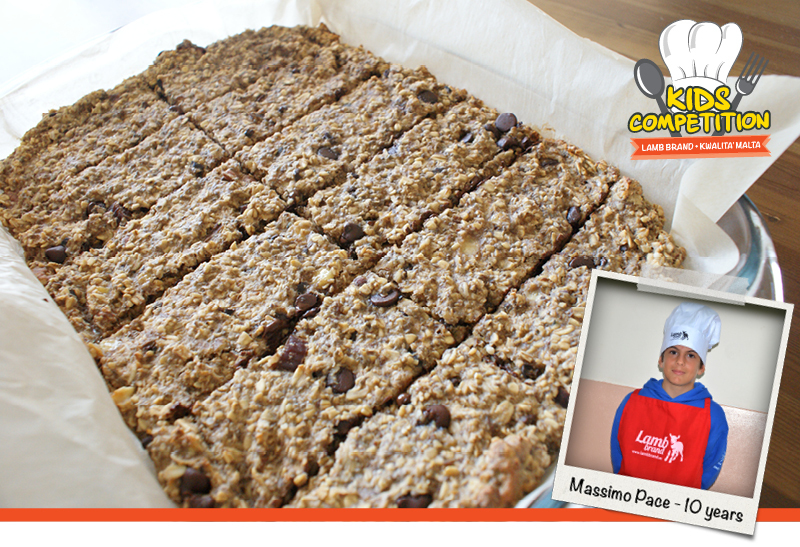 Place granola slab on a cooling rack for 10 minutes and slice into bars once they are cool. 6. Serve with some Greek yoghurt.